Hopwood-based artist Paula Hamilton meets a busy creator and teacher. I feel I could write a whole year’s worth of articles just about Avoncroft Arts Centre as there is so much going on there. I first visited Avoncroft in 2012 when I discovered Jane McMillan and Neil Spalding teaching their Ceramics classes, which take place in the beautiful, and recently refurbished, stables building there. I later returned to visit a Craft Makers Market where local, and not so local, craftspeople were displaying and selling their wares. My latest visit to Avoncroft was to meet Richard Crabtree, a gifted and versatile artist. Richard originally trained as a graphic designer at Bournville College of Art – in the days when it was essential to be able to draw and paint in order to go into this line of work, before the days of computer aided design, Photoshop and the rest. He honed his skills in various print-based design studios around Birmingham and also gained experience of the picture framing business. The experience of working as a graphic artist and framer put Richard in an ideal position to do what he does now – teach art classes and run a picture framing business! When I visited Richard’s art group, he and his pupils were working in a newly-completed studio which was warm and bright and a perfect place to teach and make art. Richard had set up quite a tricky still-life involving a pile of books on a stool, a copper kettle, rose-printed fabric and a barley sugar twist chair – not at all an easy set-up. But Richard is clearly a very good teacher and, with his gentle style, he coaxes impressive work from his students. Richard’s pupils are loyal and his classes are generally fully booked but there is good news for you if you feel like attending one of his watercolour classes, as he is planning to start a new Thursday afternoon class. I have already mentioned that Richard is versatile but have not yet mentioned that he is proficient in drawing, watercolours, pastel and oil; and that he takes personal tuition in his small studio at Avoncroft and runs whole day “pastel animal” workshops and watercolour workshops for up to 14 people. Art societies, schools and clubs regularly ask Richard to demonstrate for them and he has travelled around the country to do this. Does this busy schedule of teaching, demonstrating, running a framery and undertaking commissions leave the artist any time to do his own work? Amazingly, the answer is “yes”. 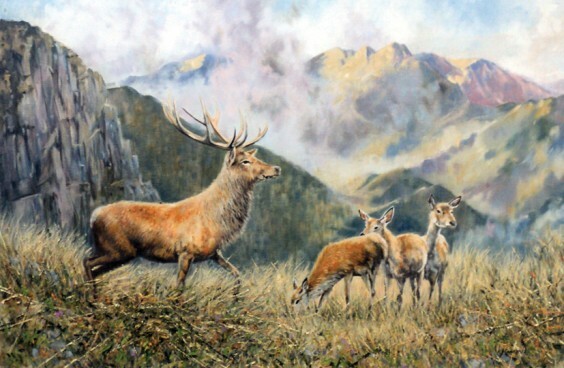 Richard has recently entered his painting of a stag, Highland Majesty, for the David Shepherd Wildlife Artist of the year competition, and has exhibited at Hanbury Hall, RBSA and many other independent galleries as well as at Avoncroft of course. He has a gallery of his work in the framery which shows off his skills well, from pet portraits to local scenes, wildlife studies, landscapes and much more. Lastly, I must mention Richard’s charming wife, Joyce, who does all the admin and behind-the-scenes organisation. At this point I feel like mentioning the quote that “behind every great man there is a great woman”. Richard and Joyce are a great double act and having her support is what enables Richard to manage all that he does so well. Bromsgrove Festival 2014 runs from June 14 to July 20 and the programme has now been released! The Festival will be packed with everything from productions and concerts to exhibitions and events from a number of local and outside groups. Venues throughout Bromsgrove will be used, including Artrix, Grafton Manor, St John’s Church and Avoncroft Museum. This year the festival is also launching a New Generation strand for children and young people to get involved, which is being organised through Artrix. The festival was first launched in 1960 to give an audience to the different arts and culture taking place in and around Bromsgrove and it has drawn world-renowned artists, with some truly memorable performances of classical music over the years. If you happen to be visiting Hanbury Hall between April 5 and 27, I have three paintings in the Long Gallery in an Art Circle exhibition there.